Several years ago, I ventured into a music store in search of a Roger McGuinn album. When teenager clerk No. 1 professed complete mystification, teenage clerk No. 2 came to the rescue. "You know," he said, "that guy who sounds like Tom Petty." Tom Petty would certainly enjoy that story because Roger McGuinn was a major influence of his, and when Petty reached back into the mist Sunday night at Summerfest for an oldie like "Here Comes My Girl," you're reminded of how much jangly impact the Byrds had on Petty. But they are certainly not the sum of his art because like all the best rockers, he has taken his influences and made them his own. 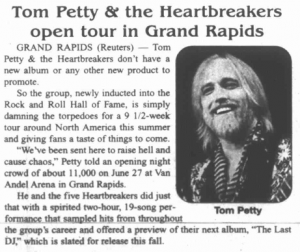 GRAND RAPIDS (Reuters) -- Tom Petty & the Heartbreakers don't have a new album or any new product to promote. So the group, newly inducted into the Rock and Roll Hall of Fame, is simply damning the torpedoes for a 9 ½ week tour around North America this summer and giving the fans a taste of things to come. "We've been sent here to raise hell and cause chaos," Petty told an opening night crowd of about 11,000 on June 27 at Van Andel Arena in Grand Rapids. He and the five Heartbreakers did just that with a spirited two-hour, 19-song performance that sampled hits from throughout the group's career and offered a preview of their next album, "The Last DJ," which is slated for release this fall. Hail, hail, rock 'n' roll. Wednesday night, Tom Petty and the Heartbreakers proved that rock 'n' roll is alive and well and living in America. Opening with a fiery version of "Runnin' Down a Dream," Petty and band drove a capacity crowd, which ranged in age from 16 to 60, to an absolute frenzy. What can we say? Mike Campbell, Mike Campbell, Mike Campbell. The guitarist for the Heartbreakers offered a mini-course in rock 'n' roll history. A night of celebratory genius. New stuff, old stuff -- fans of Tom Petty aren't picky. 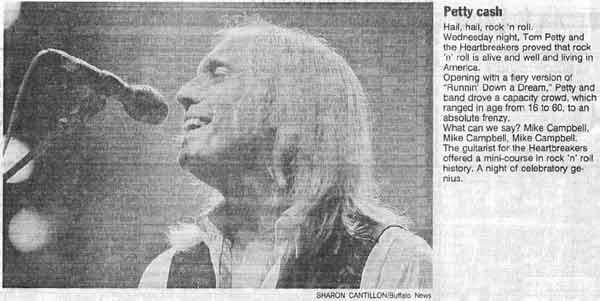 In fact, they screamed enthusiastically for both when Petty and the Heartbreakers rocked out Monday night at Mohegan Sun Arena in the group's first Connecticut show since 1999. The crowd had clearly pined for the nasal-voiced singer in the intervening years. 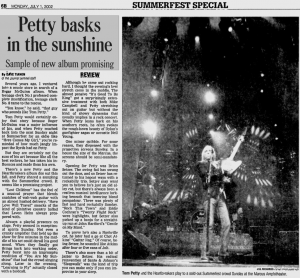 Even Petty seemed overwhelmed at times by the raucous ovations rolling down the aisles to wash over him and his band during nearly 20 songs -- not one a dud. "This is the most fun in the world," Petty said at one point, when the cheering had quieted enough for him to be heard. BRISTOW -- Tom Petty doesn't need laser effects and dancing girls. His music is more than enough. 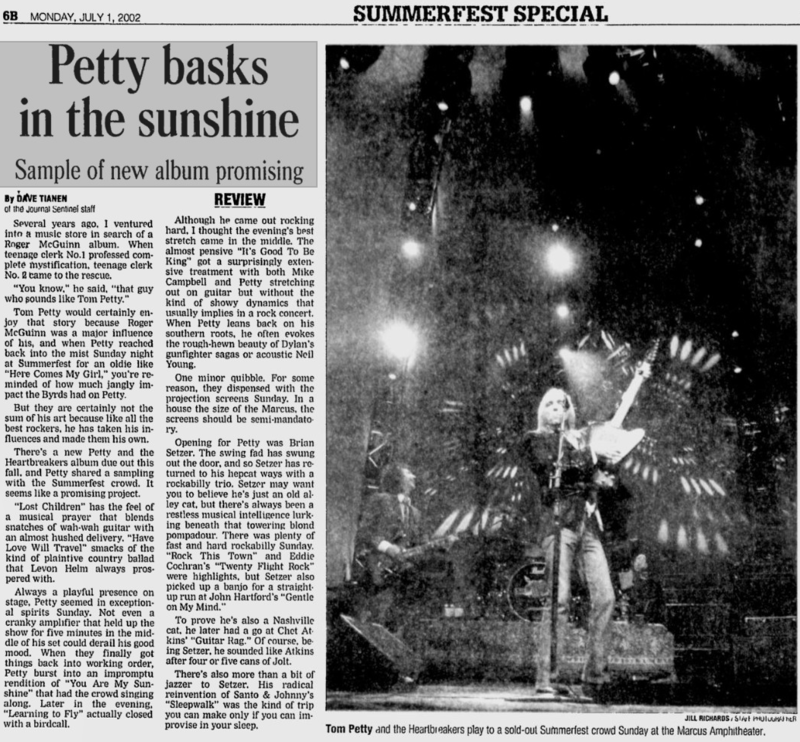 Petty and his backup band, The Heartbreakers, packed two hours last week at Nissan Pavilion with a quarter-century worth of memorable songs. The show opened with "Running Down a Dream," which had fans leaping to their feet and dancing in the aisles with the first chords. Other hits included "I Won't Back Down," "Even the Losers," "I Need to Know" and "Refugee." Through an 18-song set and three encores, Petty enthusiastically played songs we all know. He's played them at every single concert for years because that's what the fans want -- it's very obvious that Tom Petty & the Heartbreakers are about performing for their fans and not for themselves. 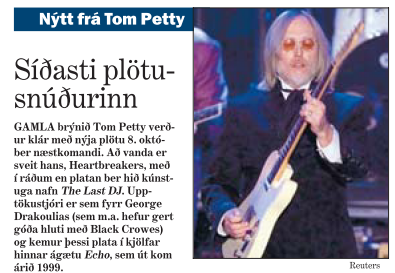 Gamla brýnið Tom Petty verður klár með nýja plötu 8. október næstkomandi. Að vanda er sveit hans, Heartbreakers, með í ráðum en platan hið kúnstuga nafn The Last DJ. Upptökustjóri er sem fyrr George Drakoulias (sem m.a. hefur gert góða hluti með Black Crowes) og kemur þessi plata í kjölfar hinnar ágætu Echo, sem út kom árið 1999. Tom Petty and the Heartbreakers' 17th album, "The Last DJ," won't be released until October, but the band has been previewing three of the new songs on its summer tour -- "Lost Children," "Have Love Will Travel" and "Can't Stop the Sun." The album is an angry screed, blasting greed in the corporate rock world, but the tour's set lists have been heavy with crowd favorites; and, with Jackson Browne opening the second half of the tour, expect the emphasis to be on good times and rock 'n' roll as they wrap up the series next weekend with two Northern California shows. Which, in the case of Tom Petty and the Heartbreakers, is a good thing. For 27 years, with and without his band of brothers, Petty has established himself as one of rock and roll's most consistent, dependable and rewarding artists. Tom Petty and the Heartbreakers, "The Last DJ" (Warner Bros.). Petty's last album, 1999's "Echo," rang with the sadness of Petty's divorce. Now happily remarried, "The Last DJ" stands to be a little more playful. Featured guests include Lindsey Buckingham and original Heartbreakers bassist Ron Blair, who hasn't played on a group studio album since 1985's "Southern Accents."